Waverly Post 142 pitching hand Tanner Cunningham throws a pitch to a Portsmouth Post 23 batter in what ended up being a rain-shortened contest back on June 13. Despite solid performances on the mound from Tanner Cunningham and Jake Reed, along with a pair of hits by Talon Osborne, the Waverly Post 142 Shockers’ baseball program wasn’t able to keep the momentum that it had gathered over its first 13 affairs as Waverly fell to Jackson, 5-1, in a Thursday evening contest as part of the Jim Jadwin Memorial Tournament in Chillicothe. Osborne collected a pair of hits in three trips, Cade Powell added a hit in two visits to the dish, and Ian Gillen walked, stole a base, nabbed a hit, and scored a run in two official visits to the dish, but Waverly’s only run came across on a Jackson error in the third inning. Jackson, meanwhile, added four of its five runs via the unearned variety as three Waverly errors stymied the Post 142 efforts. Pack and Cunningham added walks, with the latter ultimately throwing three-and-a-third innings of three-hit baseball. Jake Reed threw two-and-two-thirds innings of one-hit baseball in relief. Despite a solo shot by Jalen Miller that gave Waverly Post 142 an early 1-0 advantage, the Shockers couldn’t hold off a strong offensive onslaught from Post 1 out of Wheeling, W. Va., who scored in each of the first four innings of action and put together multiple frames in three of those four innings en route to a 9-4 victory over Post 142 on Saturday afternoon in a contest that was moved to Adena. Miller, who hit his first homer of the American Legion campaign on a 1-2 count and the eighth pitch of the contest, led the way by going 1-for-3 with the home run, an RBI, a walk, and a run scored in the contest. Jake Reed (1-for-3, double, RBI) and Elijah Vogelsong-Lewis (1-for-3, RBI) also reached the hit column, while Kannon Pack (walk, run scored), Nate Keiser (walk, run scored), Luke Lindamood (walk), Ian Gillen (walk), Tanner Cunningham (run scored), and Reid Chapman (run scored) all contributed to the Waverly Post 142 output. In their victory, Post 1 collected 10 base hits, including five that went for extra bases — two of which went for homers — in the 9-4 win. Vogelsong-Lewis was able to slow Wheeling’s output down a bit as the sophomore-to-be threw three-and-a-third innings of four-hit baseball while striking out four and walking only one in relief. 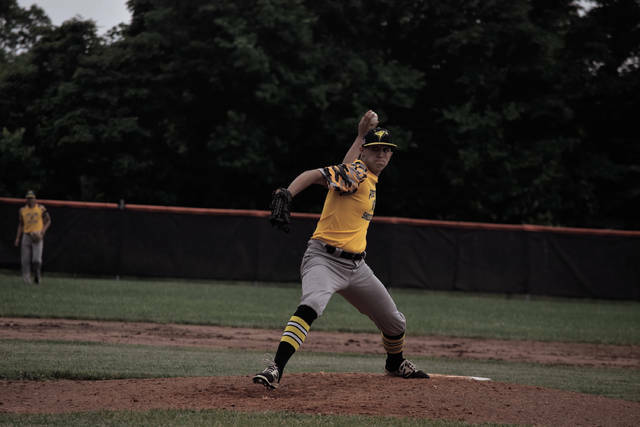 Despite a pair of hits from Talon Osborne and a second home run blast by Jalen Miller, the Waverly Post 142 Shockers’ baseball program wasn’t able to claim victory over the Cowle Post 151 baseball program in Waverly’s final contest as part of the Jim Jadwin Memorial Tournament. Waverly, who fell behind by a 1-0 tally after the top half of the first inning, turned a leadoff single by Ian Gillen into a run to tie the score after a groundout, a flyout, and a wild pitch followed. When Cowle followed by producing a second run on a fielder’s choice to take a 2-1 lead in the top half of the third inning, a one-out single by Nate Keiser, along with a walk from Gillen, allowed Miller to follow with his three-run shot to right field, which gave the Shockers a 4-2 lead after three innings of work. The seven errors that Waverly ultimately committed, however, proved to be too much to overcome. Cowle scored three runs in the top half of the fifth inning of play to retake the lead, and survived a run-producing double by Osborne by adding three more runs in the game’s final two innings of action to retake the advantage for the third and final time. Miller (1-for-3, home run, walk, three RBI, two runs scored), Gillen (1-for-2, two walks, two runs scored), Osborne (2-for-4, double, RBI), Keiser (1-for-3, run scored), and Tanner Cunningham (walk) all contributed to the cause at the dish for the Shockers, who collected five hits during the contest. Post 142 (12-4, 2-0 SCOL) will travel to Portsmouth for the big league matchup that awaits on Tuesday evening at 5:30 p.m. at Branch Rickey Park.